Broadband Data and Development Grant Program. 2012-2014 "State of Missouri-State Broadband Data and Development Grant Program – Structures Inventory Addressing"
This project is to review and update the geospatial structures data relative to Community Anchor Points and will be a subset of State of Missouri-State Broadband Data and Development Grant Program – Structure Inventory Addressing. 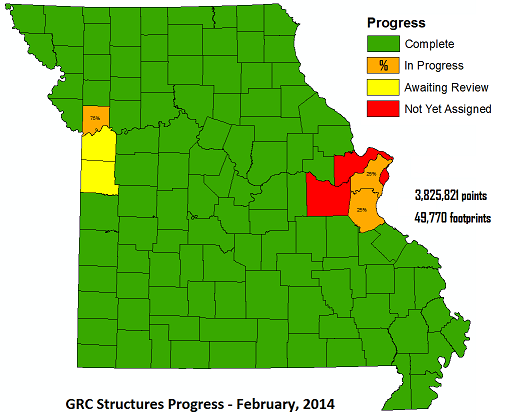 Coordination of these review activities (and coordination with the State of Missouri) are to be provided by the University Geographic Resources Center (GRC) Director, acting as the principal investigator (PI) for the 2012-2014 "State of Missouri-State Broadband Data and Development Grant Program – Structures Inventory Addressing" . Regional geospatial staff will provide the local area expertise to review, attribute and update geospatial data collected from many sources. In some cases it will be necessary for the consultant to add additional records as new structures are constructed within the region’s boundaries. Onsite training in database access and maintenance will be provided by the GRC. The regional consultant will represent the project within the region at outreach or user group activities and perform other specified duties as required.